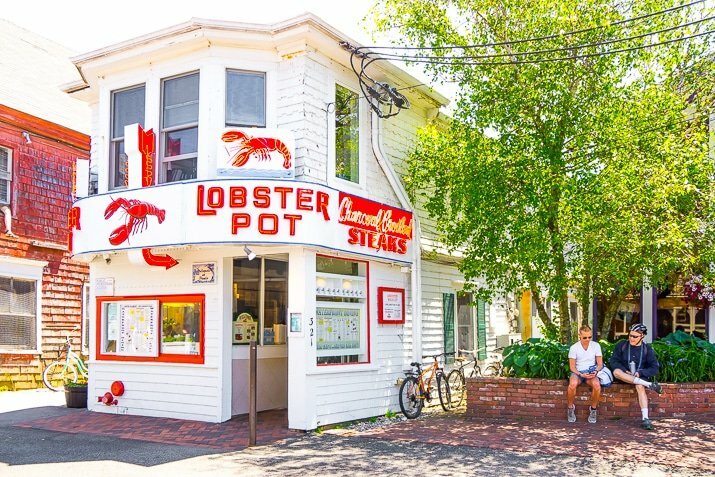 Looking for a summer getaway in New England that’s lively, loaded with great restaurants, and steps from the beach? 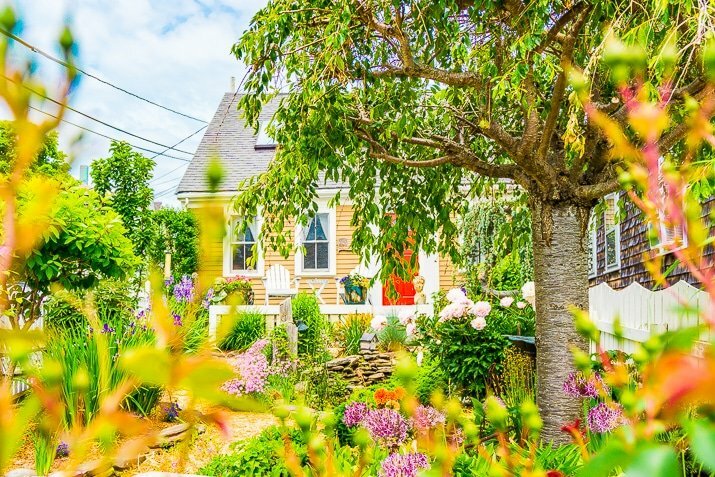 Provincetown, MA, nestled at the tip of Cape Cod is the place to go! 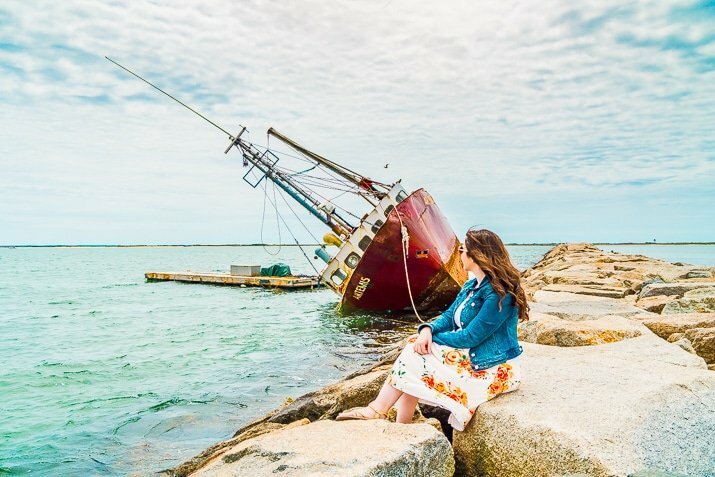 This trip to Provincetown, MA was sponsored by TripAdvisor, all of the opinions and recommendations in this post are 100% mine. I’m almost ashamed to admit how little I’ve explored New England considering I grew up and live here, but whenever I go somewhere, it’s usually the same places. 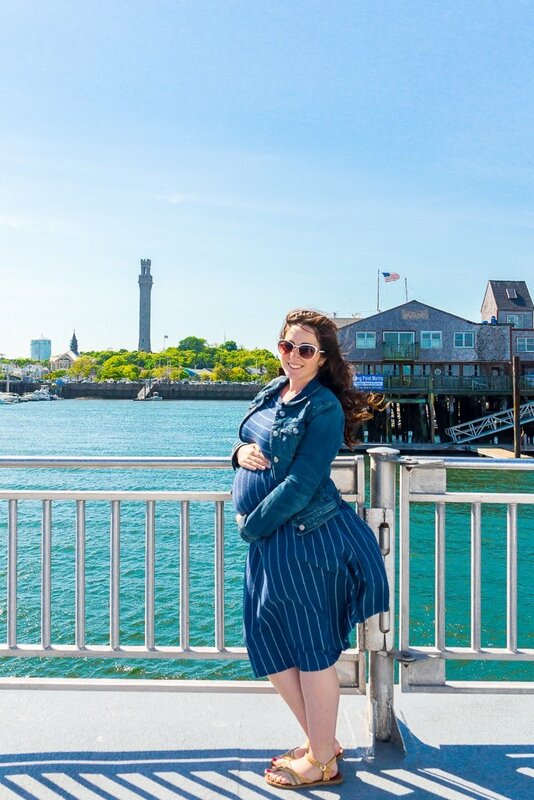 However, being pregnant this summer and wanting to stay close to home, but still having the travel bug, has been the perfect opportunity to get out and explore some new places in my own backyard. I honestly had no idea what to expect when I decided to go to Provincetown, MA for the weekend, but I am so glad I did! Provincetown is a place unlike any other I’ve ever been. It’s such a vibrant and lovely coastal town where all are welcome and dogs are encouraged! It’s a place that I felt safe, where everyone in every restaurant we went to just wanted to chat. I loved getting recommendations from the locals and tourists alike while we were there, it’s a true sign that food really does bring people together. 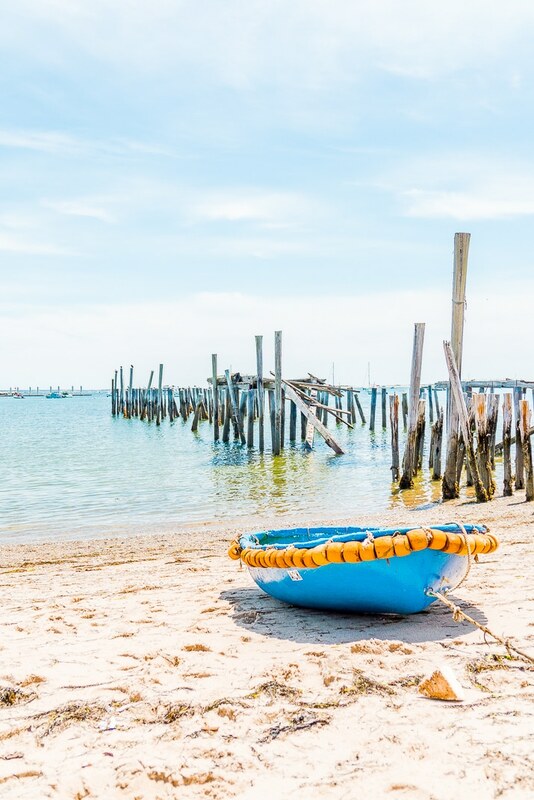 Provincetown has been a haven for many over the years, it’s a tolerant town that many could learn from, so don’t be shocked by the drag queens strolling the streets, or the people riding around on motorized coolers, it’s all just part of the fun of going to Provincetown. And although it’s a hot destination for the LBGTQ community, it’s a welcoming place for all travelers and you’ll find plenty of couples, families, and groups of friends walking Commercial Street all year round. It’s a great place to spend the weekend for a Bachelorette party too! Provincetown sits on the tip of Cape Cod and was actually where the Pilgrims first landed when they arrived in the New World. But after a few weeks, they realized that it wasn’t the best location to settle in and moved on to Plymouth where they made the first settlement. Also, can we talk about how PTown might be the most charming seaside town ever, it’s meticulously maintained and adorable. The gardens are gorgeous and you can tell that people have put so much work and pride in their homes. The whole town is seriously picture perfect! Getting to PTown is easy, and there are a few different ways to do this. I knew I wanted to get there the easiest way possible, so I hoped on TripAdvisor to see what past visitors recommended. Many people left reviews for driving and for flying, but it was the ferry that caught my attention, the best part was that I was easily able to book our Ferry tickets right on TripAdvisor. Tickets are $65 to $93 per person Roundtrip depending on age. Cape Cod Fast Ferry TicketsBuy Now! After purchasing your ticket voucher, simply call Boston Harbor Cruises to confirm your tickets and time, once you arrive at Long Wharf, you’ll trade your vouchers in for tickets at the desk, you can’t miss it, it’s right at the beginning of the dock. I highly recommend booking their Historic Harbor Cruise too! TripAdvisor is the world’s largest provider of tours, activities, and attractions, with more than 56,000 bookable experiences in 2,500 destinations worldwide. 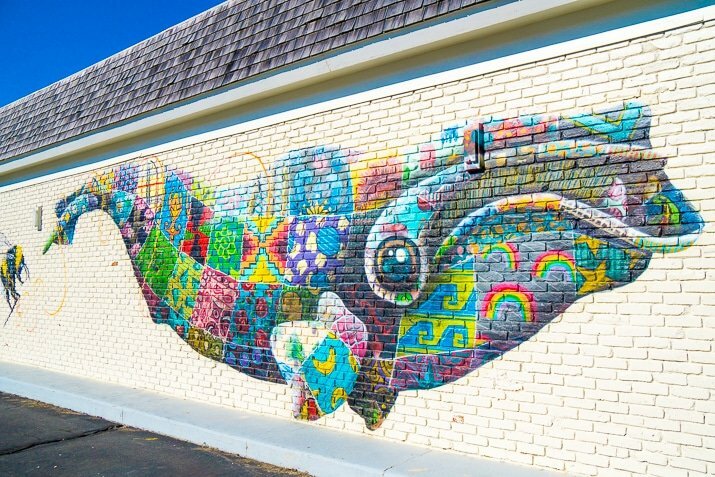 While you’re looking for ideas on TripAdvisor for your stay, don’t forget to check out some of their other great tour offerings in Cape Cod! Ferry: We opted to take the ferry since it leaves right out of Boston Harbor from Long Wharf and arrived right in the heart of Provincetown. The ferry crossing only takes about 90 minutes and gives you a great view of the city as you depart and arrive at the docks too. The ferry had plenty of seating with some tables both inside and outside. bring Sea Bands or Dramamine in case the water is choppy. Drive: In 1914, Cape Cod was separated from the mainland by a canal, but there are two bridges you can take to get across. If you are bringing a large group and plan on exploring Cape Cod outside of PTown, driving would be my recommendation, however, traffic to and on the cape between mid-June and early September can make the other two options much more desirable. Fly: If you’re coming from away and already flying into Boston’s Logan Airport, this might be the easiest option if you want to add a connection and take Cape Air across the bay to Pronivetown. However, this is also the most expensive option starting at around $80 each way per person. There are a number of different ways to get around the town and they vary from free to a bit pricey, so do what works for your time and budget. We used a mix of walking, Uber, and Taxi while we were there. Walk: This is probably the most common way to get around town. Many of the restaurants and shops are along or just off of bustling Commercial Street, plus you’ll have the opportunity to pet all kinds of puppy dogs along the way! Bicycle: Another easy way to get around and many of the area inns and hotels have bikes that can be used and there’s also a few places that rent them out. Shuttle/Trolley: Unfortunately we weren’t able to use this method of transportation because we went Sunday through Tuesday in early June, but in just a few days they will be running every 30 minutes, 7 days a week, around the town. Day passes are just $6.00 per person making this a great way to get around. Check out the stop locations and schedule. Uber/Lyft: Both ride sharing options exist on the cape, however, many of the drivers are only there on the weekends during the shoulder season, this left us having to use the taxi service Monday night through Tuesday afternoon. The average fare from the center of town to our hotel was about $8 to $10. If you haven’t yet signed up for Uber or Lyft, I highly recommend it. It’s my favorite way to get places when I’m not up for walking and it’s much more affordable than a taxi. I prefer Uber, my husband prefers Lyft, they’re essentially the same thing and many of the drivers drive for both. Use the buttons below to sign up today and claim your free rides! Taxi: Generally, I’m not a fan of Taxies. I got seriously taken advantage of in Florida a couple of years ago and that pretty much soured me forever. But sometimes you don’t have a choice. Luckily, the taxi fares are town mandated so you always know how much you’re going to pay. We used Pride Taxi (508) 487-3400 while we were there, but there are a few other companies as well. The fare is the same for all of them and is on a per passenger basis. It cost us $7.00 per person to get from our hotel to the center of town and it was $8.00 per person to get to the ferry terminal. Different locations around the town have different rates. Drive: The town isn’t very big and there are just a few main roads, so I can’t imagine you’d get lost getting around. However, there are a lot of one-way streets and a lot of people and parking seemed to start around $15.00 per day from what we saw on the signs. There are plenty of options from Luxury Hotels to Cozy B&Bs to stay in, but we chose to stay at the Harbor Hotel. This place caught my eye because it is totally cute, I loved all the retro colors and the fire pit and pool are a total plus! But it also was one of the best prices in town at just $139.00 a night, which was a steal compared to some of the other places we scoped out. TripAdvisor also had great reviews for the place, which made our decision even easier! you never miss out on a great deal! The rooms were comfortable and clean, we stayed in a standard double queen room. We loved that it was a more quiet retreat from the busier end of Commercial Street. The hotel is pet friendly and has a few bikes for use, but is just a 15 to 20 minute walk to the center of town. Harbor Hotel ProvincetownBook Your Stay Now! Finally, we’re onto the important things in life… the FOOD! 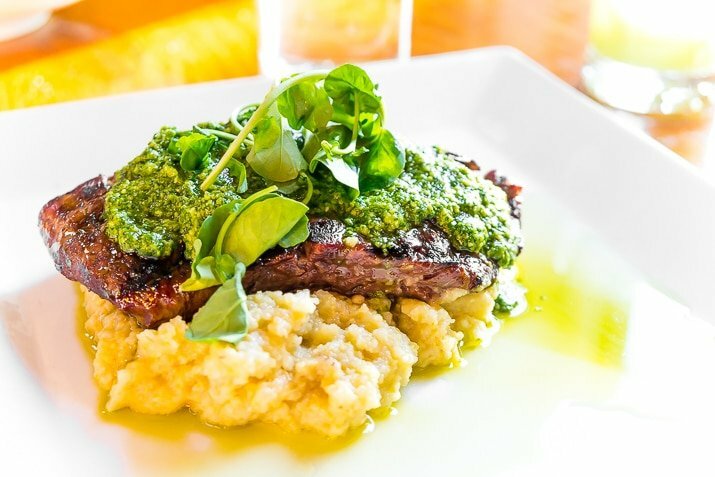 PTown has no shortage of amazing restaurants, here are my recommendations for where to eat while you’re there! Joon Bar – Definitely our favorite meal of the trip and our first, so it was a pleasant welcome into town. You absolutely MUST get the Duck Sliders… they are insane! We also got the frites and house salad as well and split it since we did two dinners that night… I know, I know, but it was hard to choose. Ciro & Sals – If you’re craving Italian food, this is the place to go. The courtyard is absolutely adorable and covered in ivy and twinkling lights and inside, you’ll feel like you’re in an old Italian Osteria in the heart of Tuscany. I got the Burro e Formaggio and it was wonderful! Edwige – We went here for dinner one night and while it was delicious, it wasn’t mind-blowing. I got the rib cap steak (pictured above) and a cucumber soda. it was also a little pricey, but again, it was decent and quite and would be a great spot for a more romantic evening. Cafe Heaven – This place falls right behind the Joon Bar, in fact, we actually ate here twice we loved it so much. Once for breakfast and once for dinner. The pancakes are amazing, especially the raspberry pecan, and the chicken and sweet potato hash is mouthwatering! 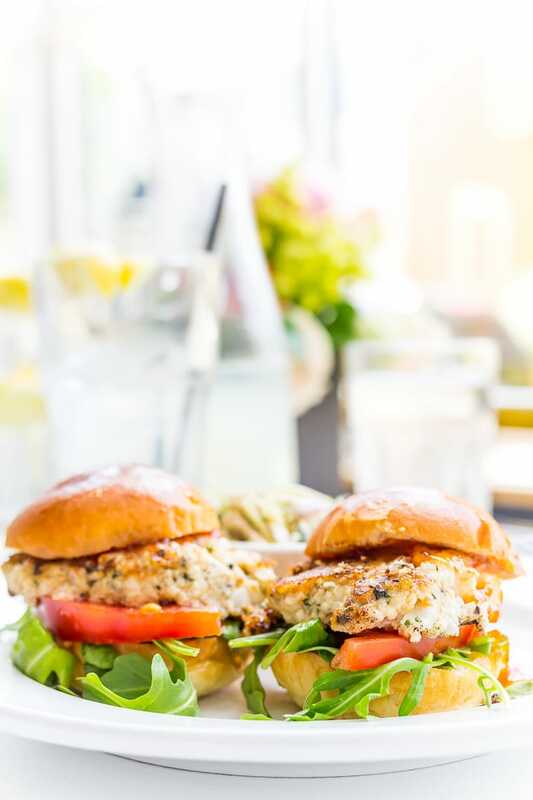 I got the cod sliders (pictured below) for lunch and my friend Jilly got one of their salads. Both meals were delish! The Canteen – Another lunch favorite (although they are open for breakfast and dinner too), this place is a bit cafeteria style, you order at the counter and take a number and they will bring your food out to you. I recommend sitting out back in their picnic style beachfront seating. I got the fish and chips which was good and the couple next to us had the crispy Brussels sprouts and were raving about them! Liz’s Cafe Anybody’s Bar – We went here for brunch and it was delicious. We got the Flippers and the Chicken and Waffles and devoured everything. This place has a really fun atmosphere, the bar itself is actually an old boat! Kohi Coffee – If you’re in need of a little caffeine to start your day or carry you through the afternoon, this is the place to get it. Connie’s Bakery – Guys, this place! Everything looked amazing and it was so hard to choose, but we opted for the Carrot Ball, which is basically a carrot cake shaped like those Snowballs you loved as a kid and topped with cream cheese frosting and shredded coconut. O.M.G. It was soooo good! Relish Bakery – We actually didn’t try any of their baked goods, but they had homemade Blackberry Lemonade that was tart and refreshing and the perfect pick me up for our morning walk. 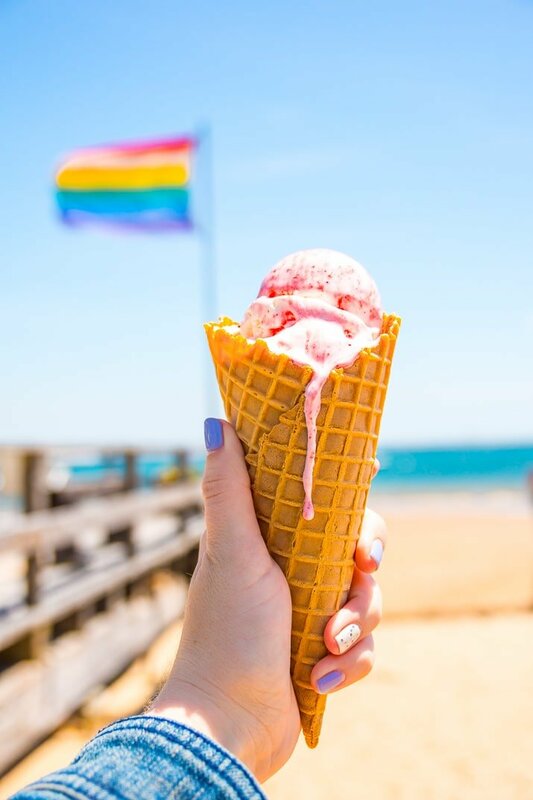 PTownScoop – I can’t resist a delicious waffle cone filled with housemade ice cream, this place had tons of fun flavors, but I opted for the Strawberry Cheesecake! Purple Feather Treatery – This place has gelato and tons of delicious and over the top desserts. We loved the chocolate mousse! 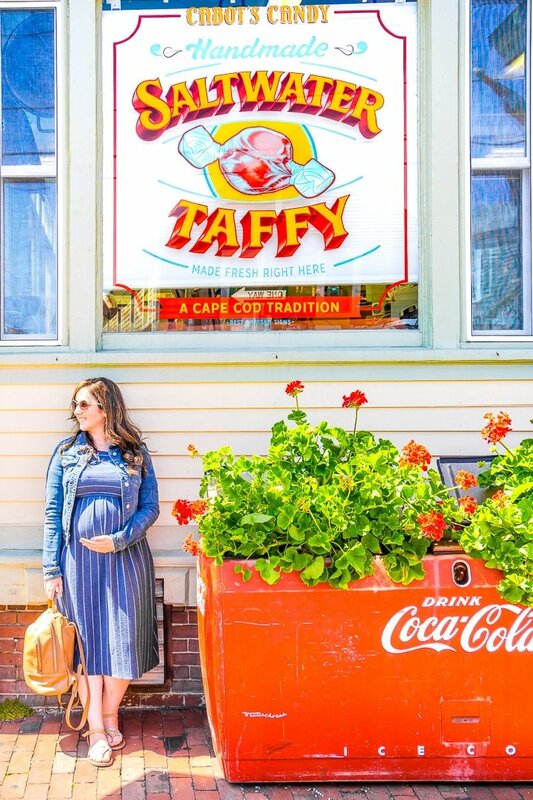 Provincetown Fudge Factory – Okay, so you can’t exactly get a meal here, but the peanut butter cups are amazing, so make sure to stop in a load up on some sweet treats before heading home! Here’s a map of all the places on this list as well as a few others recommended by people we met but didn’t have time to get to. When I was in the beginning stages of planning my trip, I immediately went to TripAdvisor to search out things to do because I know that I can always find tons of great information and real reviews there from other travelers! TripAdvisor also makes planning your trip a breeze with it’s easy to use website and mobile app that let you search out the best things to do ahead of time or on the go! 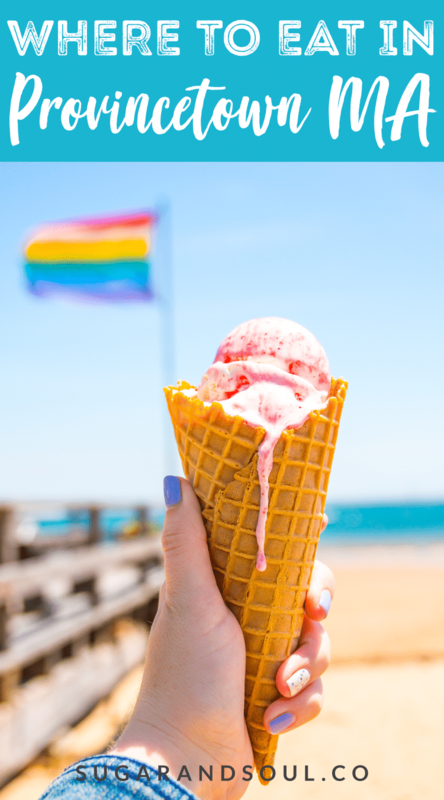 There’s plenty to do in and around PTown, but we mostly opted for eating and walking around, so I can’t speak to many of the activities, but here are some that came recommended to us. Shopping – There are tons of great shops and art galleries along Commercial Street and I highly recommend taking a couple hours to walk around and check them out! Artemis Shipwreck – We walked to this one morning because I had seen a photo of it on Instagram and was intrigued. The Artemis broke free of its moorings during a Nor’Easter this past March and wrecked itself along the breakwater (seen in the photo below). You can walk right up to it. Eventually, the town plans to remove the wreck, but it will be costly and therefore isn’t likely to happen right away. 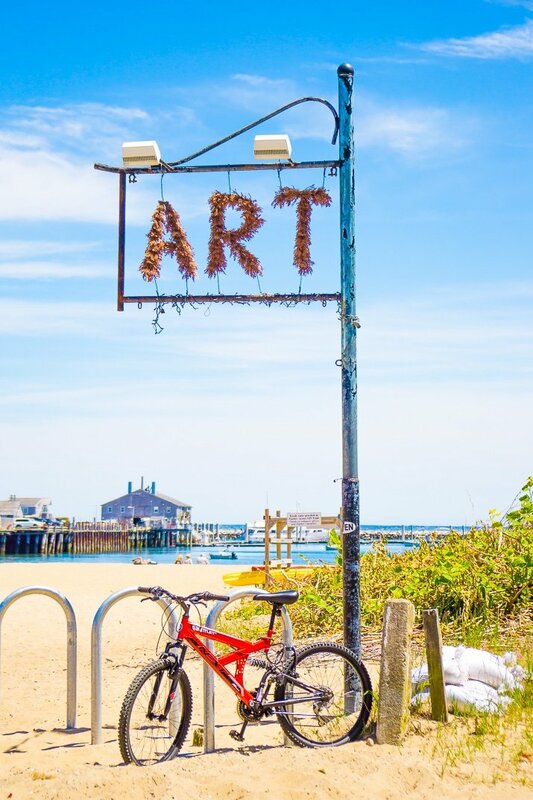 Provincetown Art Association and Museum – A couple miles outside of the town center you’ll find the art museum loaded with beautiful exhibitions. The Sand Dunes – Since PTown is essentially a giant sandbar, there are a lot of dunes around and can make for a pretty walk. You could also book a tour with Art’s Dune Tours. Cabaret – I wish I had known to book tickets for a show before going because so many people said it was an absolute must. There are a few different theaters and box offices around town, so pop in and check out the options! Pilgrim Monument – If you want to visit this historic monument and exhibit, it’s just a short walk up the hill from Commercial Street. It’s $12.00 per adult to enter. 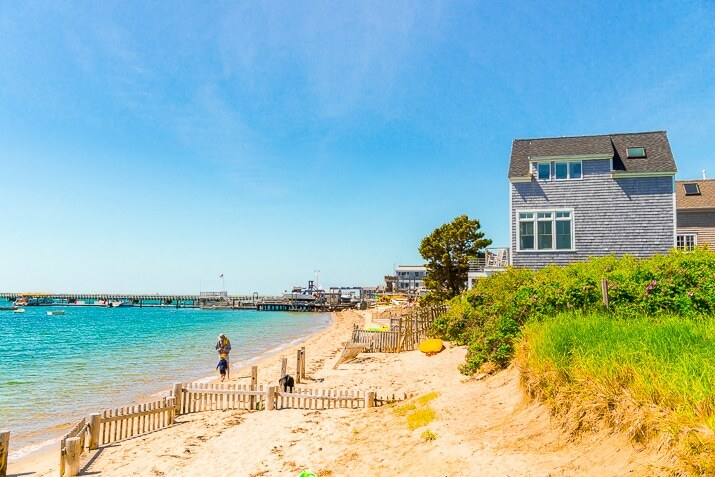 Beach – Provincetown is surrounded by soft sand beaches and the water is remarkably clear in some areas. So pick and spot and hunker down with a good book (and your sunscreen) for the afternoon. Want to Save this post for later? Pin one of the image below! I live, and grew up, on the other end of Cape Cod–Sandwich. P-town certainly is an interesting place to visit. Loved your review; pictures are awesome! Overall, Cape Cod is beautiful to visit, but is far too expensive for a single, one-income person to live. So I’ve started a search for places to live–in Maine! My family camped there every summer for years. I believe that’s where my heart is and where I belong. Yes, our taxi driver told us that pretty much everyone who lives there works multiple jobs just to live there, but I’m glad it’s close enough for me to visit regularly. I live in Maine and it’s such a beautiful place to live. 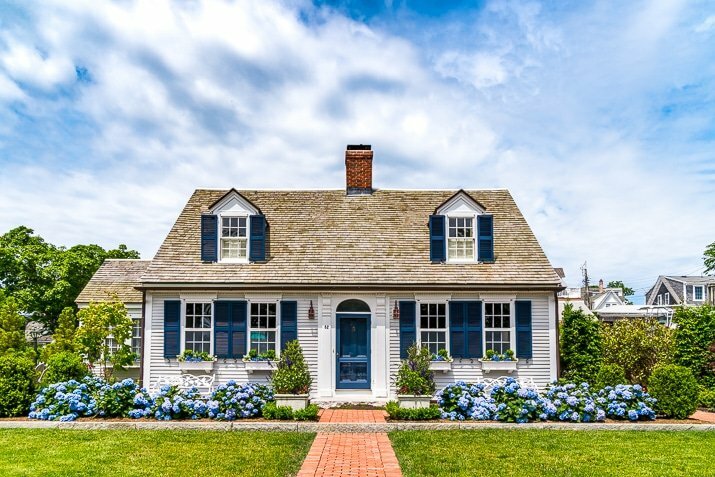 And although it’s expensive to live in Southern Maine and along the coast, the interior is quite affordable compared to a lot of places in the US. I hope you find a place to call home soon! Also, a big congratulations on the upcoming birth of Evangeline! I am so happy for you and your family. I look forward to reading more about this milestone in your lives. Blessings! Rebecca, I enjoyed your great photos and recommendations. You gave readers so many good tips on Provincetown. As a person who loves Ptown and visits frequently, I was hoping you could update your Provincetown Art Association and Museum (PAAM) pointers. 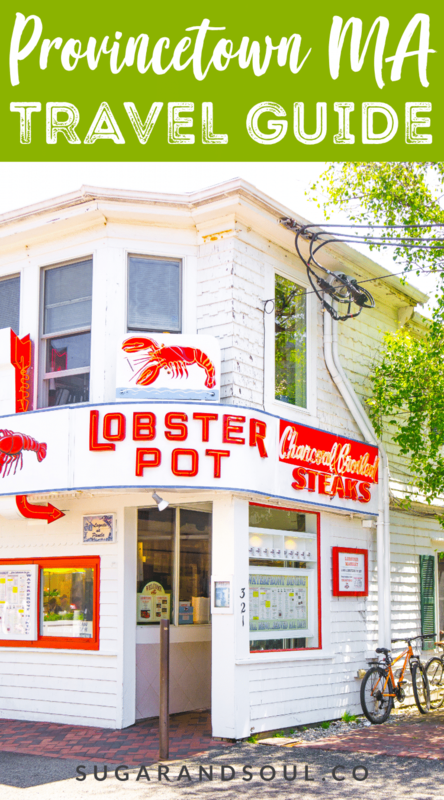 It is about a 10 minute walk on Commercial Street from the center of town (like the Lobster Pot) to the museum. It’s a great place….wonderful exhibits, classes, lectures, music, etc… Tip: you are free to use their restrooms, even if you don’t pay admission. If you walked down Commercial from the center of town towards the Harbor Hotel you stayed at, it’s on your left across from Angel Foods, a yummy market for your next stay! I hope you get to go to a show at the Art House or Crown & Anchor. We’ve seen a few and are going to Thirsty Burlington’s “Cher Live” show next week. Maybe you’ll be back after your little one arrives! My oldest child slept a solid 5-6 hours as a newborn on one of our visits to Ptown, I’ll never forget that milestone! Must have been the salty air, cool breezes or tranquil setting! Hi Sandy, thanks for providing all of this information, we didn’t actually make it to the museum this trip so I didn’t have much advice to add on it, but hopefully other readers will find your advice helpful! I hope you enjoy the show next week, a show is definitely going to be at the top of our list the next time we’re there!